A citizens’ effort to ban all corporate campaign contributions in D.C. elections may get new life. The Board of Elections ruled recently that D.C. Citizens for Public Trust didn't collect enough signatures to put the measure on the Nov. 6 ballot. The group is going to court to overturn that decision. 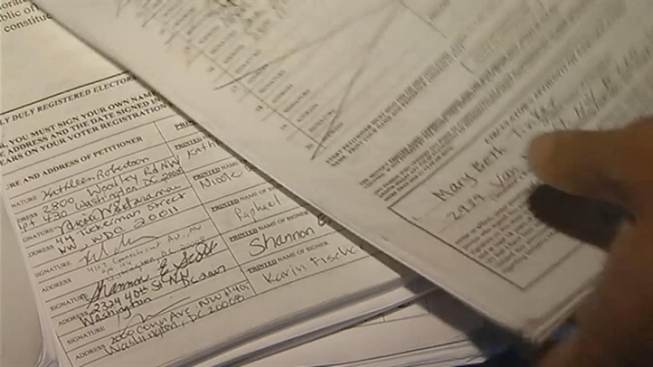 D.C. Citizens for Public Trust spent the past two weeks going over all 30,000 names on its petitions to have corporate contributions banned from all city politics after the Board of Elections said the group fell short of the 22,000 names needed to qualify for the ballot. The group has found thousands of errors with the count conducted by the Board of Elections, according to Bryan Weaver, one of the leaders of the effort. In a lawsuit in D.C. Superior Court, the group says the petition should be granted a speedy review because the deadline to get printed on the ballot is just weeks away. Supporters of the ban contend all D.C. politicians depend too much on corporate contributions that sway public policy decisions. A move in the D.C. council to ban corporate contributions failed in a 12-to-1 vote last winter, with only one council member, Tommy Wells, voting in favor of the ban.